A detailed description of what you did during your STEP experience. During the three weeks that I was in Ecuador, I made countless memories with my community, host family, and learned a great deal about the Andean culture. 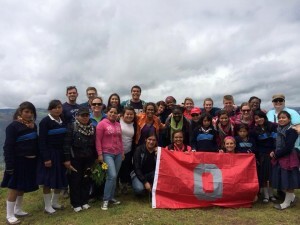 During the first two days I was getting accustomed to thinking and talking in Spanish while we were touring in Quito to get a feel of the community and language to prepare myself for when our real service learning would begin in a small community school in Cahuazhun Grande. In Quito we went to several different churches of various denominations, all of which were lavishly built over several years and refurbished. In addition we walked around the city and what struck out to me was how all the kids would say “Hola” to us as they passed by. In America, probably only one out of a class of 30 would work up the courage to say “Hello” to a stranger on the streets! Furthermore, everywhere in Ecuador we went, we saw stray dogs of every breed that were similar to people in that they knew how to use crosswalks and ate human food. As my preparation time to get accustomed to the Ecuadorian lifestyle that fit me in Quito ended and our time in Cuenca began I was feeling more comfortable with my surroundings. I arrived in Cuenca by plane later in the night where my host family picked me up at the airport while it was pouring rain. When we finally arrived to their house, I was exhausted but excited to see the house and my room. The layout of the house was very unique in that it had several open areas and was decorated with various items from around the world. Before exploring the house, my host family invited me to sit down and chat with them so that they could get to know me and the other host students that were rooming with me. In addition, there was another Ohio State University student already living with them who had come on Friday and was staying for 6 weeks! After chatting with them and discussing their expectations of us, we toured their lovely house. The next morning would mark the beginning of our service learning experience in Cahuazhun Grande which I was excited, but nervous about. At 6:20 am sharp I woke up to get ready for our first day at the small village school on top of a mountain at Cahuazhun Grande. Our breakfast every morning consisted of either tea or hot chocolate and a small sandwich. In addition our host mother would always pack us a hearty lunch to bring with us to the school. The bus ride to the school took about 1 hour 20 minutes and was extremely bumpy, however the view as we ventured to the top of the mountain was breathtaking. When we first got to the school, there were several children peering curiously at the ginormous bus that my group was in. About 75% of the children were wearing muddy school uniforms and the rest were wearing everyday clothes. When we got off the bus we were not sure how we should approach the children and ended up staying in one cluster of university students and the other cluster were the kids and the teachers. Thankfully, our Ecuadorian partner who helped organize our service learning experience broke the silence and we began with the welcome ceremony. This welcome ceremony was nothing like I ever experienced. The teachers laid a beautifully red, black, and white woven carpet on the ground that had four arrows in every direction on it. They then sprinkled beans and other seeds along the carpet. Next, three of the teachers stood at each arrow and our supervisor from Ohio State stood at the last arrow. The teachers then asked her to talk about the wind, which none of us were expecting and had no idea what to say. After this the other teachers standing spoke of their elements and thanked us for coming. During this time we were all standing in a large circle around the 4 teachers and mat where the kids of the community school were interwoven in between us students to make us feel more connected to one another. After each teacher spoke, they handed us one bean to thank us. At the end the last speaker handed us a dried corn cob which they wanted us to plant to represent the growth of our relationship together. After the ceremony we were then split up into groups of 2-3 and assigned to different classrooms. My group was assigned to a group of 7th graders where there were 14 boys and 1 girl where the teacher of the classroom was a University of Cuenca student named Patricia, or Pachi for short. The first day we solely observed the students and teaching methods to get a feel for how the kids normally act, how they were disciplined, and their schedule for the day. Their schedule usually was that the kids would arrive at school at 9- 9:30 am and go to their corresponding classrooms where they would be taught two different subjects until 11am where upon recess began until 11:55am when another class would begin until 12:40am. After 12:40am the kids were dismissed and we would each lunch and either share our culture with the teachers or have them share theirs with us. From this afternoon discussions with the professors, I was able to learn about how they cured diseases, Andean cosmology, the community life, and their teaching styles. To cure diseases, it would be costly for them to go to a hospital at the bottom of the mountain so over several decades they have been using herbal medications for every ailment. The person in charge of recognizing the herbs, growing, and cataloging their uses/effects was the curar of the community. She showed us various plants such as chamomile which is called “Melissa” in their native language, Quechua. Furthermore, some of our students were able to take part in what they believe as a cleansing of the soul tradition where the curar would pat the individual down with a bunch of plants all over the upper part of their body with their arms spread out and eyes closed for about 3 minutes and then spit a mixture of sugar cane alcohol on the student’s head. The curar told us that this tradition was to help prevent diseases from coming to the body by cleansing the soul. For Andean cosmology, they believed in four different elements which were all interwoven. Furthermore the teacher said that life was like a mirror in that as we walk into our future our past is reflected into a mirror in front of us where we learn from it. As for the community life, we were told of how about 25% of the community had at least one family member living in the United States where they were sending money back to their families in Cahuazhun Grande. Due to the prices of everything being cheaper in Ecuador since the minimum wage is about $340 per month in certain areas, the families receiving money from people in the USA were better off and tended to have extravagant houses among the other houses. However, at the school we did not see any economic rankings among the kids, they all got along together from what we could tell. Furthermore, the older women of the community always wore traditional Ecuadorian outfits that consisted of a shaded woven hat to protect their skin from the intense UV light, a white blouse, a colorful skirt lined with lace or a design, and braided hair. The community worked together and believed that every gift must be returned. As for their teaching styles, they believed in a different approach than what I was used to. The teachers and their students seemed more like friends where the teachers would regularly hug or receive hugs from their students and the atmosphere between the two was solely respect and love for one another in such a tight community. In addition, on the second day of us being there, she readily allowed us to teach even though we had no credentials and were not prepared to teach so soon. During that second day I ended up teaching them words and numbers in Cantonese which they really enjoyed. After the first day of teaching, I was ready to teach again the next day, except this time I had prepared material. I taught them about the Cherokee nation and how this indigenous population had leaders in their community that impacted the USA. After this we made totem poles where they drew people, things, and objects that they valued. The days after this I taught them more words in Cantonese, traditions in my culture, life in the USA, and games that I played when I was little. During the week, I was beginning to make bonds with a lot of the younger kids who I was not teaching. Three of the kids which I had the strongest bonds with was a 3 year old boy named Matteo, a 5 year old girl named Blanca, and a 6 year old girl named Karina. 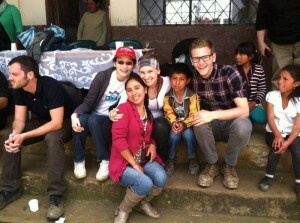 These three kids were full of energy every day and absolutely loved everyone! They would go up and hug us or hold our hands while we went on walks through their village where they would sing to themselves or point out various different places along the trail. As the days passed and my time in Cahuazhun Grande was nearing an end, my bonds with my group of students increased as well. I knew their personalities, some of their personal lives including their parents and siblings, and most importantly, their names. On the last day at the school each of my students came up to give us drawings that they made for me which was very touching. Near the end of our stay we had a large feast together where we were able to witness their traditional dances and foods. The dances were performed by every age group, ages 6 all the way up to the elders in the community. For food, a pig was killed and roasted wherein the killing of the pig was viewed as a source of entertainment for all of the village including the toddlers at the school. In addition, corn, a staple food in their community, was served. A common delicacy in all of Ecuador is cuy, which is guinea pig in English which was also served to us. Furthermore, at the end of each day I had dinner with my host family wherein I would talk about what I did and my thoughts about what I did and saw. One interesting conversation I had with them was the current Ecuadorian government. They told me that many people in the community were not happy with their government. In addition, while shopping in the main market, I saw several graffiti about the community’s opposition to the government. During our free time I usually would check my emails and tell my family what was going on and my thoughts and feelings, go over all the photos I had taken thus far, and walk around the ever crowded market place. While exploring the city by ourselves as students, we got a feel for how we were often viewed purely as tourists and were often targeted by shop owners to buy their goods. It was also interesting to see how there were almost no street signs marking the cobbled roads. In addition, there seemed to be a strong distinction between the traditional indigenous community and the more “modernized” community because the indigenous community at the marketplace would be wearing a traditional outfit and their store would consist of fruits or vegetables in a wheel barrow or basket that they hand grew. On the other hand the more modernized individuals would be selling their merchandise similarly to how it is in the USA with several packaged goods in a store. A personal response to your STEP experience, including feelings, thoughts, judgments, and what you have learned about yourself and your assumptions from what you did and how you reacted. Going into the Ecuador I was really nervous that I would not be able to communicate effectively with anyone and that I would just be laughed at, however at the same time I was excited to be in a completely new country on a continent I had never been on before. Furthermore, I was scared about whether or not I would be able to teach anything of value to the community and gain anything from them. After the first day in Quito, I felt comfortable being in the new country because everyone we met seemed friendly, but I was still quite nervous about having to communicate independently to someone in Spanish. This fear gradually went away due to the help of my host family and the children at the school who helped to encourage me in my Spanish speaking skills! I learned that it’s good to be scared at the thought of entering a new country where not everyone speaks your language, and that over time I saw that the people of Ecuador all had personalities just like the people in America. Some people were incredibly welcoming while some were distant. After the initial day at the school of feeling my around being at the school, I felt comfortable and ready to spend the day with the kids. However, as the days passed by, several questions about the community arose in my mind. Is going to the school for only 2 weeks good for the kids, where some have lost parents and need stable role models? What do the kids expect of me and how do they see me, as some foreigner who will be gone after a couple days and is a temporary friend or as a permanent friend who they want to stay connected to? Are the kids actually gaining information about how indigenous communities should find for themselves whether or not they want to become more modernized or is our presence of students from the USA making the impression on them that everyone in the USA is like us making them want to leave their community to join us? Lastly, if I were to communicate with them when I went back to the USA, should I show them photos of my community or would that make it look like I was bragging? These questions I believe can only be answered through time by going back to the school years later to see the impact we had on them by seeing where the children ended up going to, furthering their education and leaving their community or staying within their community. As I am still pondering at these questions I feel glad even though I cannot answer them because to have such deep questions reflects the strength of the bond I have for this community and the impact they have had on me as an individual. These questions which could be applied to several other aspects of service learning would have never risen if I did not go on this trip and give it my all. The trip has led me to think more critically about the situations that I am a part of and witness and to see the greater influences. One part of going to Ecuador that I knew that I would have a hard time with was the common food and drinks. I personally am not fond of juice and am hesitant to try unfamiliar foods which was a great obstacle. Every night our host family would present us with a new type of fruit juice that they had made themselves and a dish that I was not used to. The first two nights I only took a couple sips of the juice to try and be polite, but I always felt terrible as they were collecting the dishes and my cup would always nearly be full. I then realized that doing this was probably making them uncomfortable so from thereafter I always forced myself to drink the juice even though I was not used to it. Being a huge animal lover and having had hamsters before, trying and witnessing the cooking of the cuy, guinea pig, was also an incredible challenge for me. Seeing their body shoved onto a pipe and roasted on top of a fire made me nauseous, but I worked up the courage to try it. After trying it, I felt like it tasted like raw fish. Although there was not a turnaround in my food preference, I am glad that I did drink the juices and try the cuy to make my experience more memorable. In addition I also learned that even if I don’t like the thought of something, I should put my own preferences second and showing respect for those who made it by consuming what they give me. Discuss how the things you experienced and learned during your STEP experience will affect your academic, personal, and life goals moving forward. The experience in Ecuador was definitely worth it because I was able to take away several life skills. One of the most important skills that I learned was to think critically. Similarly to how every intake of a drug has an effect on the body, some more toxic than others, every action has an effect on another individual. Thinking critically about not only the situations, but my actions will help me in every area of my life- my academic pursuit of working in a children’s hospital where I will need to carefully examine my own behavior while interacting with the children and their parents, my personal life where I will no doubt face various challenges wherein I will need to be able to think critically to find the most justifiable answers, and my own life goals of becoming an individual who is capable of discerning the benefits and consequences of every action made. After learning more about their herbal practices, I believe that my pharmaceutical sciences career has been influenced. In a world where there are several manufactured drugs that make use of various chemicals reacted with one another, maybe a simpler approach such as going back to the classic grinding and mixing up of common plants might be more beneficial and cost efficient in certain cases. I think that by seeing the mindset of the curar I have more respect for herbal medications. In addition, by the end of the day I was completely exhausted both mentally from thinking in Spanish and physically from playing with the kids. By the time it was to sleep, I was glad to be able to talk to my roommates in English to give my mind a rest. From this experience, I now have a glance of what it must be like to be an international student at the Ohio State University. Having to sit through lectures not in your native language about material crucial to your future career and having to translate that in your head while taking notes is incredibly hard and exhausting. I now have more respect for international students who have to go through this every single day during the school year. I believe learning this will affect my personal goal of becoming an individual who can relate to others and be able to make that connection with international students. This experience has taught me that I only know so little about the different cultures around the world and how that culture impacts the way their country is governed. It has set a new life goal for me to widen my knowledge of cultures. The first picture was taken after a tour of their agricultural life. We learned about how they planted their crops and how they would allow the vegetation to grow randomly and not in organized plots like our farms. This way of farming showed the importance to their culture of letting nature do its own work by replenishing the soils nutrients and growing freely among what we would consider weeds. After the hike we decided to take a photo of our group of students from Ohio State, the teachers at the school, and some of the kids that went with us. The second photo is one of my favorite photos I took because it shows the connection between us, the teachers, and the children. Interestingly, we noticed how in photos the children would not smile for photos even if we asked them to. We soon learned that this was simply part of their culture. This photo was taken during the “pampamesa” or celebration near the end of our stay at the school.